Well this is my first post and also my first (and in the short term last, it took too long!) 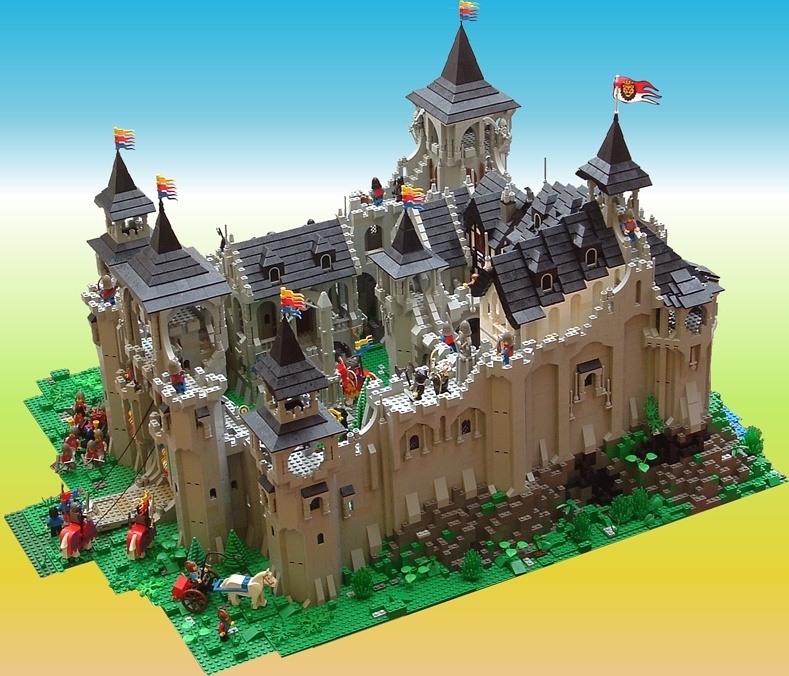 post-dark ages MOC, Haidos Castle. 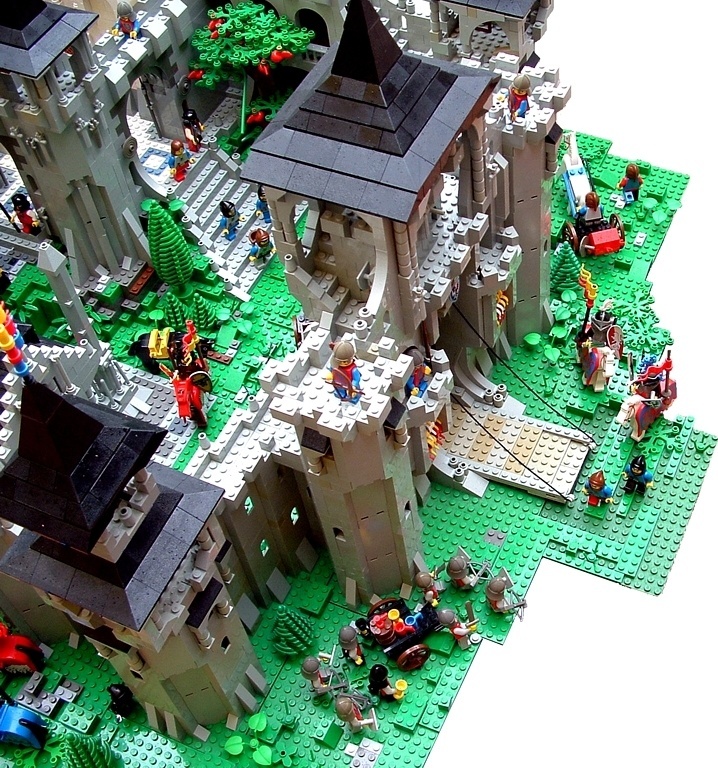 Haidos took around 8 months to build, it's kind of a large scale combination of the King's Castle, the Black Falcon Fortress and the Black Knight's Castle (the King's castle was my first major castle, i must have been around 6 at the time so it obviously has a special place in my heart). Thanks to everyone who's posted their MOCs - had a really great time going back over all the old posts and got some great ideas and inspiration in the process. 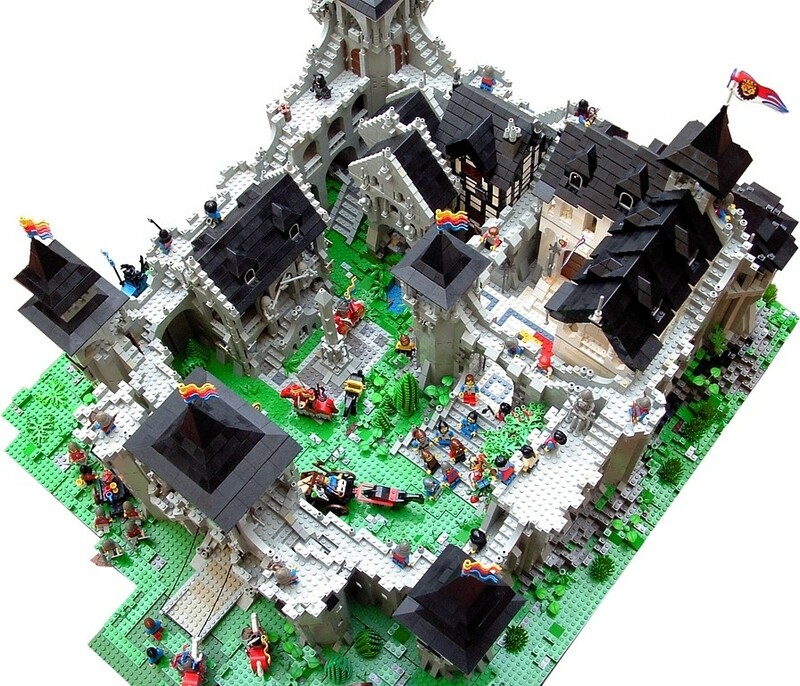 People coming out from Dark ages seems to always build awesome MOC. May be i should have one too since i cant really build. Welcome to CC! 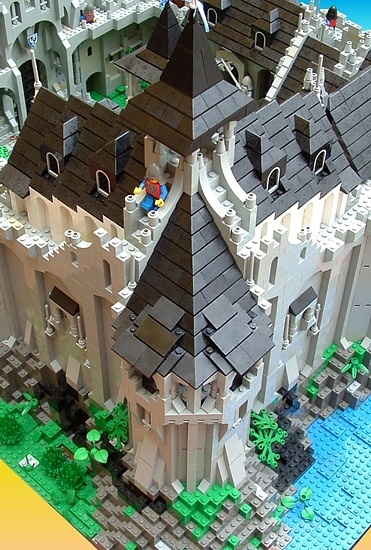 That is one sweet castle - and with excellent details! Only 8 months to build it, huh? Wow... This is amazing. The landscaping is great - I love how there is, realistically enough, very little flat space. Also, the castle architecture is wonderful. The black-peaked roofs are perfect - I like how they all meld together on the top. I also liked the statue on the walkway (by the king in the photo) and some of the flag poles you used by the window for a decoration... gives it a very medeval or somewhat gothic feel. This is quite extraordinary! I have little patience when it comes to building MOCS and normally end up wrecking them before they are finished [thats if I dont have all the pieces I need]. Spending eight months on a MOC is mindboggling to me. Great job. That guy looks like he must be an impressive warrior, btw, is there any backstory about him? Or about the apple-obsessed king? 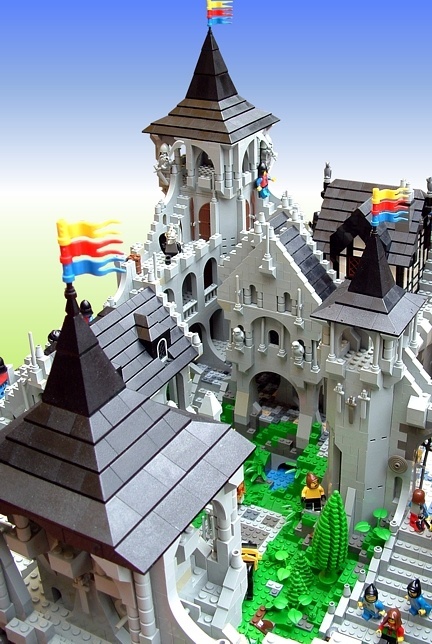 You know, you're not exactly required to do multi-baseplate, full-scale castles. It is okay to do small fortresses, town buildings, carts, catapults, etc - the sort of thing that could take an afternoon or a weekend. We won't get mad. Great work, and I hope you stick around here and join in more of the fun. The details are all really inspiring. And this castle is, above all, very original. the sort of thing that could take an afternoon or a weekend. We won't get mad. Trust me, they don't get mad, cause that's what all my stuff is lately (not enough lego to go serious). Wow.......that's absolutly awsome to the core man! i can't even pic out critisizm cause you outwieghed any with coolness. You even put detail on the wall windows, your collection of stone minifigs is impressive. Welcome of this fair and cool place we call CC, hope you like it, and I look forward to seeing more. This is probly the nicest forum I've ever had the honor to join, and now you have to! This is incredible! When I first clicked the deeplink, I thought one side was part of a ruin because of the odd shape. But when I looked closer, I found that it was whole; seeing this has been a wonderful breath of fresh air from the castles we usually see. I sat here for a long time just letting everything sink in, and I'll definitely be going back to it once the folder is public. First of all welcome to CC! I don't know how to explain what I felt after looking at all the pictures. I'm not surprised building this took you 8 months. It's so beautiful, asemetric, lively, with wonderful scenery, a lot of GREAT detail (I'm a sucker for statues in MOCs), and yet creating quite a realistic feeling. And it's awesome that you paid so much attention to the pics. They've come fantastic. That guy looks like he must be an impressive warrior, btw, is there any backstory about him? I agree... I actually missed this shot, but it's a beauty! Nice combination with the fig-head, helmet and especially sword... he looks very royal... but a bit sneaky. It seems like this castle is bustling with character (and characters). 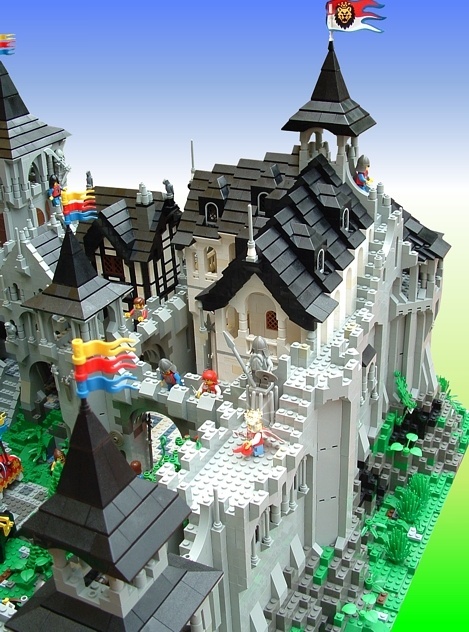 Very cool, has a fantasy-type castle look to it but still seems realistic. I can't wait for the gallery to come public! Also, nice landscaping and action of figs. This is an excellent fantasy type castle! There's a lot going on in this castle and everything is wondefully detailed. I love how the castle is just crammed with detail and landscaping. Great job on taking pictures too, all the pics look great.